is published for the members by the Society four times a year (June, September, December, March). Each article is in Japanese with a summary in a European language. is an English journal published by the Japanese Society of Cultural Anthropology (formerly the Japanese Society of Ethnology). 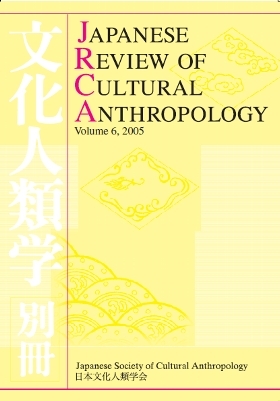 JRCA was launched in 1998 as an independent occasional publication, with the aim of introducing anthropological research in Japan to our international colleagues in the form of review articles. Since 2001, the Society has changed the status of JRCA to that of a supplementary volume to Bunkajinruigaku (Japanese Journal of Cultural Anthropology), the official quarterly journal of the Society published in Japanese. While retaining its original purpose, JRCA has accepted research articles for publication since vol. 3, 2002. JRCA is published annually. Members of the Japanese Society of Cultural Anthropology are encouraged to submit articles for publication. For details, please consult Instructions to Contributors and Review Procedures for JRCA.